This story first appeared in Alpinist 55—Autumn 2016. 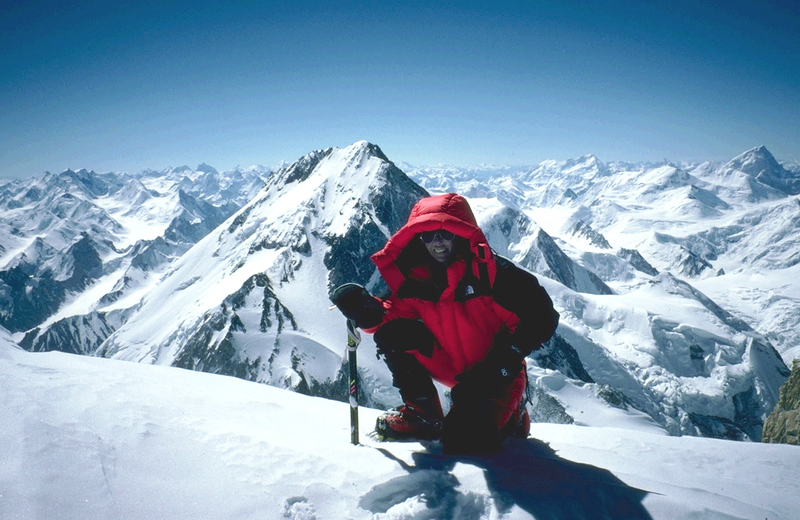 Heidi Howkins Lockwood, the writer's mother, on the summit of Gasherbrum II (8034m), 1996. I've never been here before, to Aoraki's feet. For three days, I play hide and seek. I watch the pink dawn on the snow from every angle. Each time the sun opens the door of the day, I cycle closer, my breath thick with anticipation. I follow the road along the perimeter of Lake Pukaki, on the South Island of Aotearoa. At every bend, tourists get out of their cars to take pictures of the alpine water. Icy blue. I ride into the headwind. With every rotation of my wheels, the mountain grows bigger, more real. I don't particularly want to stay in Mt. Cook Village, but I do—for three days, out of a sense of obligation. I store my panniers in a hostel and lock my bicycle. All the tourists in town face the mountain; there is nowhere else to look. I rent a backpack. I hitch a ride to the trailhead, where I walk with a Belgian couple until the sky bleeds stars. We sleep in a tiny hut. In the morning, helicopters buzz above like oversized insects, ferrying tourists in and out of the retreating glacier. I don't touch Aoraki's ice, but the danger is there: soft, immersive, a knowing tug at my ankles. 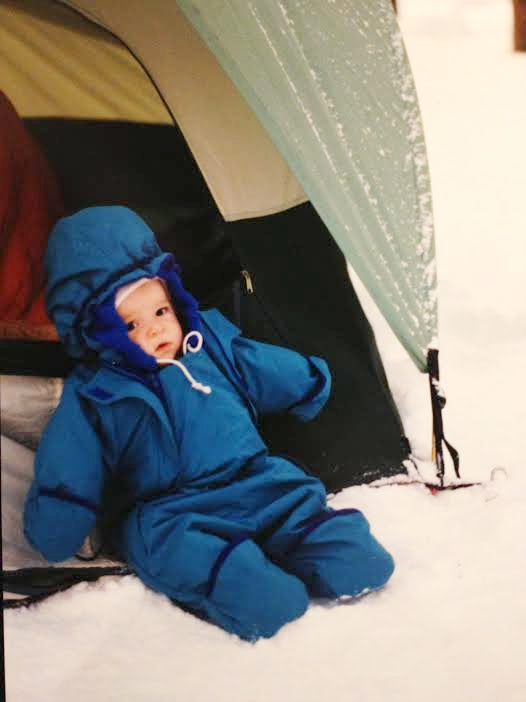 Devi Lockwood, age three months, on a winter backpacking trip, 1992. For five consecutive summers when I was young, my single mother left me in the care of my grandparents while she climbed Everest and K2, Gasherbrum II and Kangchenjunga. I remember sitting next to her on the pale blue flowered carpet of my grandparents' Connecticut home, playing with the fringe on my woolly poncho as she packed plastic barrels with carabiners and ropes, sleeping bags and crampons—preparation for a world I would never know. "Tell me you love me," I said. I crawled into her lap. "Tell me you'll be back soon." She smiled, set aside her checklist and pen, and put her hand on my hair. "I love you and I'm doing what I have to do. I'll be back in September." Too few mornings later, my grandparents and I drove to Newark, New Jersey. I watched as my mother lined up for security and took off her shoes. She waved good-bye and blew me a kiss before turning the corner to find her gate. When she returned on the other side of summer, her clothes smelled like sweat and curry. She told me how much I had grown. The first time my mother left, I got my ears pierced at the mall. I was five years old. None of my friends had earrings. My grandmother thought it was a good idea. The technician drew a blue dot on each earlobe. She held my hand as she raised the piercing gun to my flesh. I remember pressing my hands against the cool glass of the mall elevator afterward, my ears throbbing as the machine moved up, up, up. Fingerlike clouds clasp Aoraki's ridge and push their way into the valley below. The wind rattles the hostel windows. A bird flies into the kitchen, and then leaves through an open door. The British man at the front desk invites me to a sushi party with the other hostel workers. We drink. Someone makes pavlova, a giant meringue topped with whipped cream and fruit. Later, when most of the room is tipsy, Front Desk Guy lectures us about death on the mountain. Climbers who fell in the 1960s and 70s are just now resurfacing, their bodies preserved in the cold. As the glacier melts and refreezes, the corpses move annually, a slow slide into light. I slip away from the others, find a door that leads to the darkened street. My teeth hurt from the sweetness of the pavlova. I shiver in the presence of the invisible mountain, the tussock grass, the bright windows. In 1997 my mother was buried in an avalanche on Kangchenjunga. She survived by making an air pocket and slowly digging herself free. One year later, while her expedition crossed the Gondogoro La, a high pass on the trek out from K2, another avalanche hit. A low-altitude porter died: Inayat Hussain from Dassu, a village in the Shigar Valley. I think of the family his frozen body left behind. I think of myself on the swing set in my grandparents' backyard, six years old, dragging my shoes through grass and pebbles, carving a hollow in the earth with my feet. The middle swing had a bald eagle affixed to the top beam. Hazy summer afternoons, I would jump on the eagle swing and pump—nothing between me and the sky but the rushing air on my legs. "If I keep on moving," I thought, "I'll be free." I collected pebbles, brown ones and red ones and smooth ones, to put in my pocket. I sat down and ran my fingers through the green hair of the grass, looking for four leaf clovers. I wanted my mom to come home safely. Where was home? Home was where Mom would return between summer expeditions and training trips. Home was where we had a bathtub. We moved wherever the rent was cheap: next to the railroad tracks in Massachusetts, a sticky summer in Indiana, my grandparents' house in Connecticut. In Oregon, we couldn't afford a car. My mom rode her bicycle everywhere instead, towing me in a trailer behind—the eggs from the grocery store balanced on my legs. I step back into the hostel, folding my arms against an imagined chill. I pull my sleeping bag up to my neck and dream I am making a chain of paper cranes, each a different color. The chain keeps breaking. 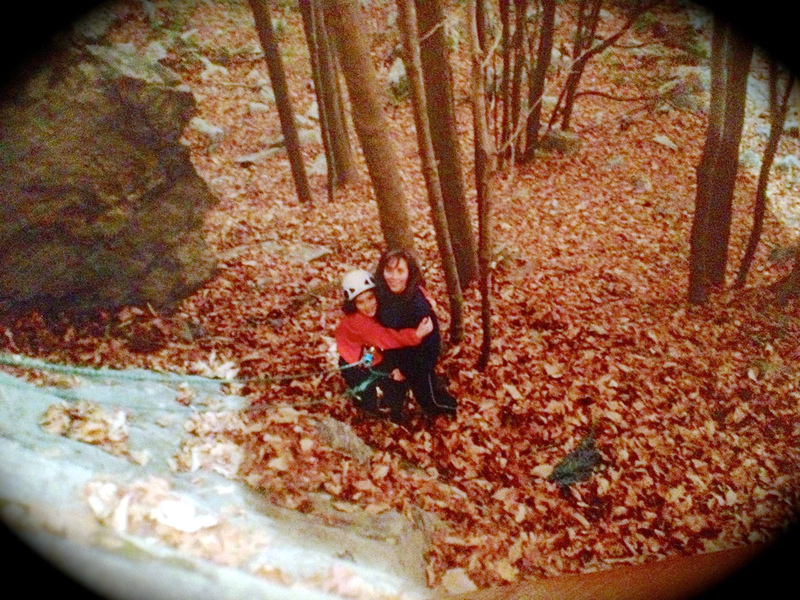 Heidi and Devi at the base of a climb at Topstone Park in Connecticut, 2001. Morning brings the now familiar pink light on the glacier. I pack up my things and cycle south. At one bend in the road, I stop and follow an overgrown pathway to Lake Pukaki's edge, tracing the path of a drop of water from the clouds to the snow, from the glacier to the lake. Where is home now? Home is every day: my bicycle and my body. Home is movement. Today's home tastes like gravel road and valley floor. Tomorrow, home will be elsewhere: other smells, lives, rhythms, and dotted lines through which to weave my way. My mother taught me how to pitch a tent, to carry a day's water supply, to cook in the wild—to start moving and keep going. We both can tolerate pain. More than this, she taught me how to leave people and places behind. She taught me how to be alone. There is glacial power in language, in naming things. I am here because my mother gave me a vocabulary for motion. This story first appeared in Alpinist 55—Autumn 2016. Subscribe today or order your own copy in the Alpinist.com store.